As the economy suffers and more of the population has less money, they are looking for things to bring some pleasure into their lives without spending money they don't have. Many are looking to the past, to bring a familiarity into their lives that they miss through mass production. Many people do not want fancy things sitting in china cabinets anymore. The craft movement is a part of Rough Luxe as more of us want handmade items that have some sort of connection to the person who personally handled it. We are reminded everyday how we should live by the bombardment of celebrities, their riches and their lifestyles, we are told to have a perfect home, mind, and body. Here design rejects minimalism and extravagance and celebrates imperfection. Rough Luxe reminds us that the plain and simple and unfinished is far more interesting than living with high end luxury goods that are mass produced. it is the celebration of raw imperfections. 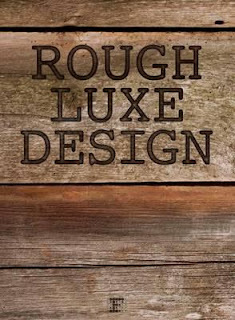 Rough Luxe creates a different atmosphere than shabby chic. Like its name it is rougher, moodier, darker and not as feminine. A room filled with taxidermy, industrial fans, a black door, a dark room, a distressed blackboard, a cracked brick wall, and an unkempt garden filled with broken statuary all bring Rough Luxe into our homes. This beautifully illustrated book showcases the best examples of how the masterful staging of raw imperfection can fulfill the desire for a luxury design. Rough Luxe is beautifully printed and published by the Curated Collection. This publishing house specializes in high quality lifestyle publications and digital media. This richly illustrated book showcases the best examples of how the masterful staging of raw imperfection can fulfill the desire for a luxury design. The book above is available in the Art Division at the Central Library, Rochester, NY. Click on the cover for more details.